High Level Puzzle & Seating Arrangement. Seating Arrangement for IBPS PO Mains 2018.Welcome to the www.letsstudytogether.co online Reasoning section. If you are preparing for IBPS Clerk 2018 you will come across a section on Reasoning Ability Section. Here we are providing you with Reasoning quiz on “High Level Puzzle & Seating Arrangement for IBPS PO Mains 2018” for your daily practice. 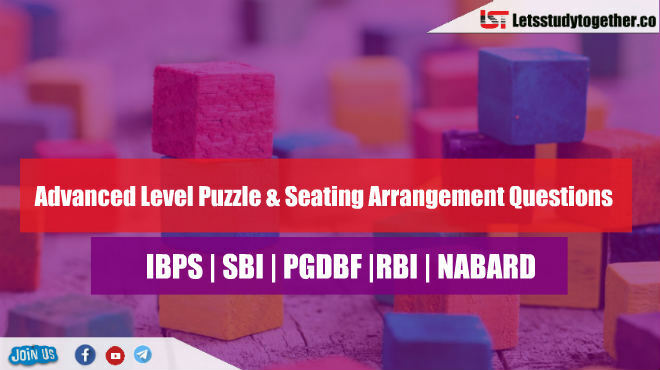 This “High Level Puzzle & Seating Arrangement for IBPS PO Mains “ is also important for other banking exams such as SBI PO, IBPS Clerk, SBI Clerk, IBPS RRB Officer, IBPS RRB Office Assistant, IBPS SO, SBI SO and other competitive exams. 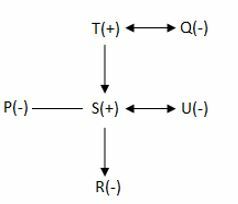 There are only six members (P, Q, R, S, T and U) in the three generation family. All of them belong to different professions among- Engineer, Pilot, Singer, Doctor, Poet and Lawyer, but not necessarily in the same order. All of them were born in different months among- January, February, March, April, May and June, again not necessarily in the same order. There is no single parent in the family. R’s mother’s only sister-in-law’s father is T. Q is grandmother of R and her only daughter-in-law has no siblings. P, who has only one niece, is sister of S. The daughter of Q is a Lawyer and was born in the month which is four months before the month in which grandfather of R was born. R, who is an Engineer, was born in the month which is three months before the month in which wife of S was born. The son of T is a Pilot and he was born in the month which is just before the month in which the poet was born. The sister-in-law of P is singer by profession. R’s father’s sister’s mother was not born in March. Who was born in February? What is the profession of U’s sister-in-law? The person who is a Doctor was born in which of the following months? Who was born in June? There are six persons (P, Q, R, S, T and U) sitting in the row and all of them are facing north direction. All of them have different amounts of money which are in multiples of 50 and each person has at least Rs. 100 with him. P, who has highest amount of money i.e. Rs. 350, is sitting fourth to the left of S. S has Rs. 200 more than Q and exactly two persons are sitting between them. T, who has Rs. 250, is sitting third to right of U, who has third lowest amount of money with him. T is not sitting at any end of the row. Who is sitting second to the right of P? Who among the following has lowest amount of money? Who is sitting to the immediate right of T? What the sum of the money of the girls who are sitting at the ends of the row? Who is sitting third to the left of R?